Great story bio-d! As I am responsible for making sure my renters are warm enough in our frigid N Wis. winters and have overseen the repair and installation of many natural gas furnaces, I have some stories too. My last emergency was due to spider webs in the intake. It was one of 3 furnaces installed on a free 10 year warranty plan, that were installed by a company that went out of business. Technicians do not like homeowner management, and even less complaints to the boss. You were right to suspect sabotage. I have a contractor now that has helped me fix the emergency (free) myself before they could respond to the call. They are so busy they were happy to do it. The warranties? Who knows? I suspect the proper papers were never filed with the manufacturer by the guy that went out of business. The fly-by-night guys installed a fancy thermostat, it broke quickly. I went to the hardware store and got a brand new, no computer chip, old fashioned thermostat ($20) and installed it myself. It works great! On the remaining savings %, are you heating hot water with gas? If so you might consider installing a timer that only heats the hot water an hour before expected use. Showering or dishwashing. This works even easier with an electric water heater. You get used to having hot water only a couple hours per day. No problem. The serial number "V" thing was really fascinating. I'll have to check into the variable design next furnace replacement. Hopefully that won't happen, the whole business might be sold by the time the next furnace goes south. My new (retirement) rental properties are going to have ground source heating. 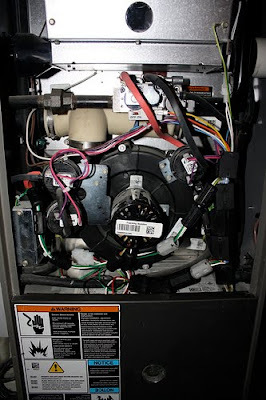 I'm hoping to leave all my furnace problems to new owners for a relaxing (semi?) retirement. Wouldn't have thought that spider webs could block a duct. Live and learn. The cutoff sensor for low air pressure in the intake is very sensitive I guess. Maybe before they had the design set up right, unburned gases could build up in the outflow pipe and explode, due to a lack of oxyugen for the burner? Making these furnaces a few percent more efficient increases the complexity and of course that multipies the possibilities for failure. Computers in furnaces? Yep. Computers in everything. I'm sick of the computerized car trend, I want a good old fashioned mechanical speed control on my electric car conversion. And a DC motor with old fashioned brushes, no inverter. I suppose a charge indicator for the batteries that triggers a relay to start the backup generator could be analog, maybe even just a relay like the old voltage regulator in cars of yesteryear? Wouldn't it be nice to have envelope heating that operated with a circulating pump triggered by a mechanical thermostat? The latest highest tech heating with low tech parts.